2009 is over! But hooray for 2010! I am looking forward to making some great progress in my wargaming life. A number of goals set at the start of 2009 were accomplished successfully. I got back into a regular napoleonic gaming group. 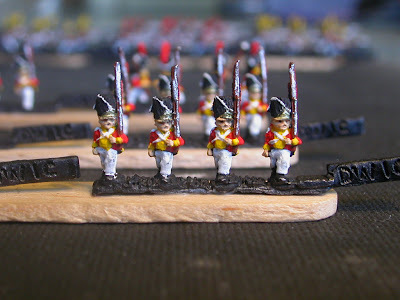 Years ago I played 6mm Napoleonics using Adler and Empire rules with a group at Forestlake and enjoyed it. Time got away from me and I stopped going for way too long. 2009 saw me back in the group and currently involved in a test campaign with France invading Russia in 1812. Click here for this campaign so far. 2009 saw me revisit a local gaming club called BIG (Brisbane Independant Gamers). This was a good move as I re-established contact with some people I knew years ago and met a whole bunch of new people. There was a lot of talk about gaming Napoleonics there and a number of guys were keen. I felt I had some knowledge to assist here so I posed a couple of questions: How many figs do you want to table? Do you want to push around battalions or brigades? do you prefer a 2 hour quick game or a 6 hour realistic game? After some discussion over a few meetings I identified 2 groups emerging - 1 group to play small scale figs with lots of them using 6mm and a battalion based game such as Empire, and the other group playing larger scale figures such as 25mm but smaller games of a division or 2 a side. We tested out a couple of rules and one of the fellows and myself put on a couple of demo games. I went ahead and paid my dues and became a full member. The problem then became that most of the guys interested in Naps at the club were really only just "interested" and really did not know what they wanted. Those that did were happy to play 25mm Empire outside of the club driven by one of the guys I met with a huge 25mm collection and good knowledge of Empire. So I dispensed with the club and regularly play with these guys instead. Throughout 2009 I spent a lot of time and money organising my gaming room and my gaming table. Lots of ideas and lots of photos later, I have settled and a few of the issues with a modular 8x4 table made up of 2x4 sections and modular terrain made up of 1x1 squares and then a whole lot of scenic items placed on top. 2010 will see more of this developed and journalled. 2009 was a good year for me for painting. After previous not enjoying painting at all, I started year researching uniforms and ideas for speedier painting and finished the year having launched my professional painting service and with a new vigour to paint. During the year I tested black versus white undercoat. No big differences in time or effect. See this documented here. A lot of time was spent researching and thinking about undercoating in major colours. I still have a couple if ideas to test out and these will be done in 2010. 1 thing I did discover is that I spend way too much time painting others figures when compared to mine. Maybe its a "paying customer" thing. My painting service site is here. This project is well on the go. After many years of collecting and painting I now have enough troops for multiple French, Prussian and English corps. And after taking an interest in 2009 in the Russian 1812 campaign, I also now have tonnes of troops for multiple Russian corps as well. The only problem I have now is troop scale. Empire recommends a scale of 1:60 which makes a French Infantry Battalion a total of 12 figures. This is great for putting together large multi corps armies in quick time. But I went to 6mm for not only large battles but also for large units. While doubling the scale looks better, it ruins the proportions for widths of units versus lengths of ranges and moving etc. at 1:300 scale a battalion of 3 ranks in line is works out to be about 60mm wide on the table. 12 figures gives me that width perfectly. Doubling this to 24 figures looks good but makes the battalion 120mm wide. Doubling the unit's depth instead makes the battalion 60mm wide and a little deeper but looks funny with 2 ranks of men when the unit is supposed to be 3 ranks for real. I know a lot of gaming in history has used 2 ranks of men so it may not be such a problem as I feel. So one of the things I need to do in 2010 is settle on a figure scale. Should I use 15mm bases and distances with 6mm figures? Should I double width and/or double depth and result in 24 or 48 fig battalions? What about 72 figures? Stay tuned for postings on this issue soon. Purchases will be slowed for 6mm Adler Naps in 2010. Just a few to fill in blanks and nothing too major at least for the 1st half of 2010. 2009 saw a lot of purchases for a game I have not actually been able to play much of yet. I don't even have terrain for it yet. I now have enough minis to get some good demo games going and will be focussing on this in 2010 with the goal of being able to develop a set of Solo Campaign rules for AA and FoF and get some games happening. Not much was done on this project in 2009. Mainly because there was a complete dry up of my own solo games. Some ideas were journalled and tested here, but 2010 will need to see some major work done on this. Major decisions made in 2009 for my terrain. With my new table, see above, I am keen to get my terrain squares finalised, and scenic items added. With my new gaming room complete, 2010 will be a good year for this. I did have a small spare bedroom at the back of the house to use as a gaming room and while it was good, it lacked atmosphere and comforts being so far away from the airconditioning and a little tightly packed. A recent trip to a friends place inspired me to move it all to the study which sits right next to the house entrance opposite the main lounge room. This room is longer and has a nice set of double doors and contains the airconditioner. Up until now it was being utilised at the office/study but seeing as my business is over, the room was cleared over the Christmas break and the gaming room transferred to it. I will post pictures when done as I have a couple of new boxes to place terrain items and it will be complete. It includes 2 full sized bookshelves with all my books catergorised along with shelves for my completed miniatures and terrain modules. All my terrain building will be stored in boxes on a shelf I built to go under my gaming table to keep it all neat and this shelf sits above the floor enough for our carpet cleaner to get under easily. Everything is off the floor as much as possible to allow easier cleaning of the room and a neater and tidier look. Should be good. Stay tuned for pics. 2010 will see a continuing of professional painting. I will have to work on developing quicker techniques and I will also make sure I intersperse client jobs with my own so I don't get to the end of 2010 and find I spent more of my time on others painting than my own. 2010 will also see some testing of various painting ideas I have. Mainly the idea of undercoating in a major colour. I believe this is similar to how Army Painter does things but obviously they would have better quality undercoats than what I can get. This morning I sprayed a Russian Infantry Battalion with a medium green, so we will see how things progress. I was thinking red or grey for English, Blue for French and Blue or Grey for Prussians. I have also sprayed my 2mm Prussians with Blue to test them with this technique also. Stay tuned. Some major pruchases of unpainted 6mm Adler ACW happended in 2009. I now have enough figures for a number of divisions and corps and am keen to see what I can do with them. Basing will not be as complex as for Naps as the Fire and Fury rules have deep basing and look good. For mass I may double the bases or number of bases or something. We'll see in 2010. A number of other ideas will need to be confirmed or ruled out in 2010. I just don't thing I can love long enough to do everything I am interested in. These include 20mm Sci Fi spec ops, 6mm Sci Fi fleets and land forces, Romans, AWI, WSS, SYW, Vietnam and Crusades. One project I toyed with in 2009 that has taken hold is for 2mm Naps. Using the Empire 6mm basing I have selected blocks to use and will be documenting this in more detail throughout 2010. My 1st full division is on the go with their undercoat drying as I type. Stay tuned. So there it is for 2010. As usual any comments or suggestions are indeed welcome. Thanks to all who emailed or commented on my blog and projects to date. Thanks for all the great feedback I have received on the Russian Campaign being journalled. I look forward to giving and receiving inspiration in 2010, which is afterall why I am here at the War Depot.